Introducing ASTECthermTM a new and improved home heating system. 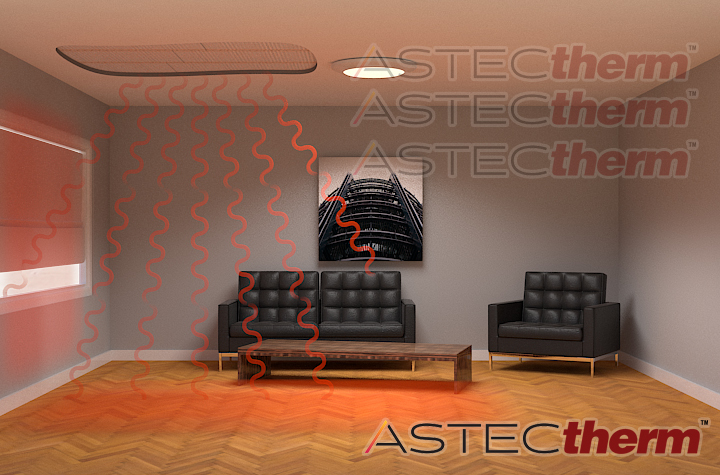 ASTECthermTM is a revolutionary Infrared Radiant Heating System which runs off a low voltage electrical current and is therefore very economical to run. Once installed, our systems are fully concealed within the fabric of the building allowing for greater wall space and clean lines. ASTECthermTM heating film can be plastered into the ceiling of your property – depending on your heating requirements. Simply send us the details of your project in the “contact us” tab and we will provide a no obligation quotation and heating plan. What are the benefits of choosing an ASTECthermTM Radiant Heating System over a conventional heating system? Most heating systems in homes throughout the UK function by warming the air in the room which then circulates to keep us warm. However, this conventional style of heating system is inefficient and wastes a great deal of energy in the heating processes. The heated air escapes through ceilings, doors, windows and any other gaps in the structure of the building. In recent years screed underfloor heating systems have grown in popularity. These heat the screed mass in the floor which holds the heat for a longer and releases it more evenly throughout the building. However, the disadvantage of screed floor systems can be the disruption and cost of installation. ASTECthermTM materials work by emitting radiant heat (infrared) which, rather than heating the air, heats the particles in the objects and surfaces of the room. With ceiling installations the material can be embedded within the plaster so that it is unseen once fitted. Since ASTECthermTM materials heat the structure and objects within the building, installation can also help to reduce damp and condensation. We are pleased to say that work done by this company is outstanding. Everything what we asked was done on time and with high precision by the professional team. During the project execution the team at ASTECtherm has applied requested changes in professional manner. There is simply nothing else to compete with this heating on the market today. It is easy to install, efficient (our largest glamping pod 6 x 3m is using less than 600 watts whereas other underfloor heating would be using 2700 watts - NO competition) and above all it eradicates mildew/mold because it warms the solid objects in the rooms. We heard about the heating supplied from ASTECtherm from searching for energy efficient underfloor heating. I was, along with my father, very sceptical about whether the heating would be as efficient as what was described. After having the heating installed now for over 2 years I am happy to say the heating has exceeded any expectations. It is simply brilliant - it is efficient, the warmth is everywhere and doesn't make my staff feel tired. I would recommend the heating to anyone who is looking at Underfloor Heating but want to reduce their monthly expenditure. Astec Int (NanoTech) Limited is a UK based company with exclusive rights to sell and distribute a range of products being developed around a remarkable, patented heating fleece.